I went way up north where the season opens before ours and the deer are much more plentiful. I tell ya I have never seen the mosquitoes as bad that far north! I thought I was still in the swamps of south Louisiana. But it was still better than being at work. 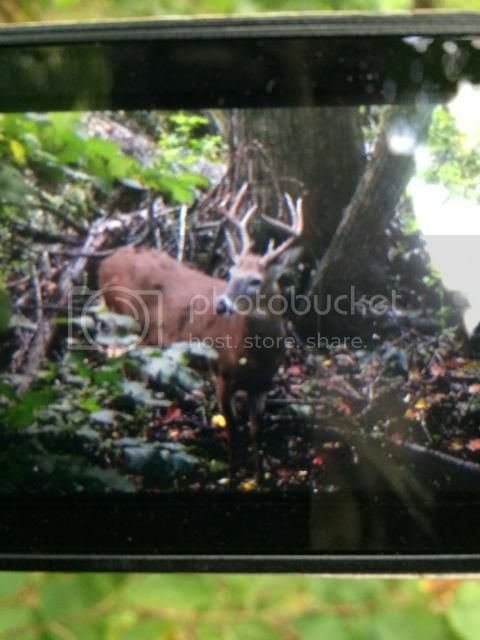 I scouted hard the first day there and had found 3 good spots by afternoon. All were on red oaks that were dropping heavy with tracks and droppings under them. I got cleaned up and went to climb in a stand I had hung one of of the spots. I was sneaking in and deer were already feeding under the tree! I put a big tree between the deer I could see and eased closer and closer. There were three deer! A young 8 pt and a doe and yearling. I didn't have a shot at the doe due to a blow down. I was now only 6 steps from my stick ladder so I slowly crept to the stand when they all had there heads down. Made it all the way up into the stand without getting busted with 3 deer from 15 to 30 yards from me. 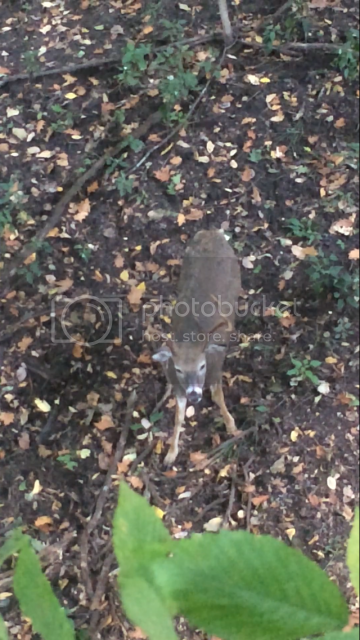 Right after getting in stand the buck and yearling headed away leaving the lone doe there. I setup my video camera and got ready. She too left the not long after. About an hour later a doe came in and started eating acorns. Took a while for her to feed to my side of the oak. When she got broad side at around 22 yards I drew and let her rip. 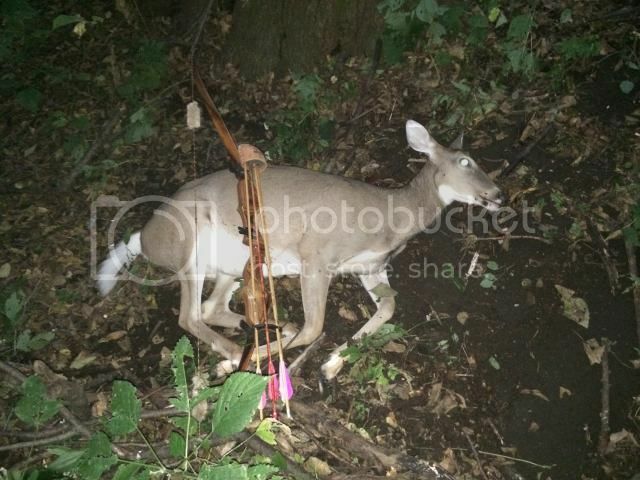 To my amazement my arrow went right under her :eek: she hoped away about 5 yards and looked around. Not her best move ;)b I reloaded and waited and she came snooping back trying to figure out what that noise was. She got to 20 yards I calmed myself and drew again, this time my arrow hit it's mark! She tore out and ran smack into a big tree about 80 yards away! Deer number one down! 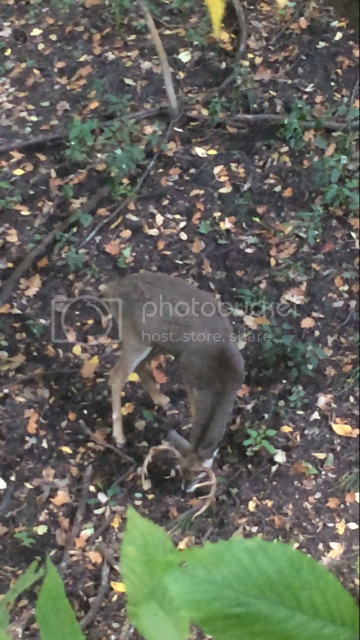 I continued to scout between hunts and finding fresh setups and was seeing deer every hunt. Letting does and young bucks walk waiting for a sure nuff good buck. I found a spot in a very deeeeep draw that had two big red oaks just raining acorns like a hail storm! I hurried back to the truck to pick up my tree stand and my recurve. I decided to just eat a little lunch there at the truck then head to the to the Oaks hang my stand sit all afternoon. While having lunch I hear four wheelers coming down the road. Three guys drive up stop and asked me if I'm hunting. They were respectful and said they would leave as not to mess up my hunt. I gathered my gear, grabbed my recurve and headed into the deep draw to setup for the evening hunt. As I'm nearing the hot feed trees I hear hollering and the sound of 4 wheelers! As I'm approaching the tree I intend to hang my stand the same 3 guys coming tearing through the woods and drive right up to me! Now I'm a little po'ed! They stop and say, "man you hiked a long ways"
They left and I'm standing there looking back up that steep hill thinking no way I'm packing all this stuff back up and going somewhere else. I hung my stand trying to convince myself that they affected me more than the deer and that they would be back to their normal routine. I got settled around 1pm and around 4:30 a yearling came in then another shortly after. Good sign I tell myself. They feed on acorns a while then leave. 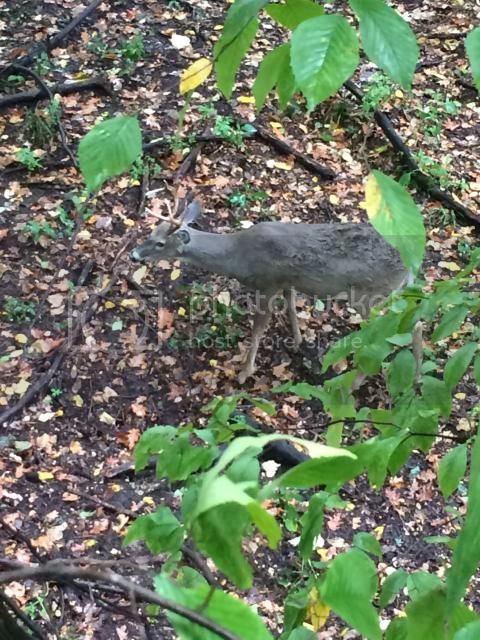 About 6pm a buck appears out of no where eating acorns about 40 yards away! He feeds in to about 8 yards broad side. Though he's a very nice buck he's still young and I just watch. Congrats again on the does, Corey! Good start for sure. Congrats brother....way to start it off!! Great Start to the season. Congrats!!! Wow, what a way to start!!! Very nice, some nice looking pics. That was exciting! 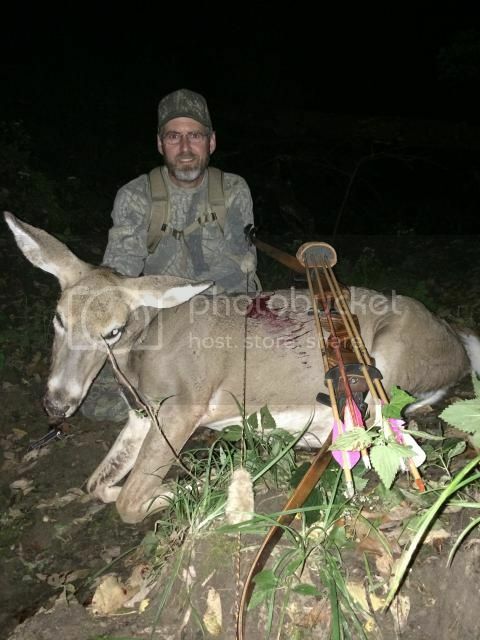 Congratulations on your very successful hunts and great pictures!